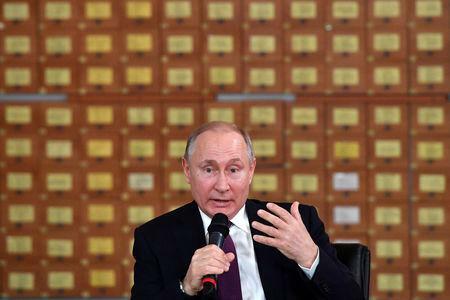 MOSCOW (Reuters) - President Vladimir Putin has signed into law tough new fines for Russians who spread what the authorities regard as fake news or who show "blatant disrespect" for the state online, an official portal for legal information showed on Monday. Under the new law, individuals can be fined up to 400,000 rubles ($6,100) for circulating false information online that leads to a "mass violation of public order". People who show "blatant disrespect" online for the state, the authorities, the public, the Russian flag or the constitution can be fined up to 100,000 rubles under the new legislation. Repeat offenders can be jailed for up to 15 days.